Chicago just launched its new Divvy bike share system on Friday after a two-week delay to address some of the problems New York faced with its new bicycle share program. Priced at just $7 per day for an unlimited number of trips up to 30 minutes each over a 24 hour period (after 30 minutes, additional fees apply), the bike share program is intended to offer a convenient alternative for trips slightly beyond walking distance but too short for transit or taxi. The Divvy’s daily rental fee is $7, which allows for an unlimited number of trips up to 30 minutes each over a 24 hour period. After 30 minutes, additional fees apply. A list of Divvy stations is posted at each station and is also available online at divvybikes.com. Locations of all active Divvy stations with real-time tracking that shows available bikes and empty return slots can be found on the Cyclefinder app, which is available for all Apple and Android devices. The inaugural day was not without its glitches and was made more complicated since it coincided with the Blackhawk’s Stanley Cup victory parade, which put thousands more people on the street. Random checks found that every slot at some Divvy docking stations in downtown was already occupied. Alta Bicycle Share is supposed to balance supply and demand by loading bikes in vans at overflow locations and shuttling them to other stations to avoid this precise problem. A few riders reported that some available docking stations would not accept bikes being returned, causing a headaches for the riders who’re responsible for the $1200 bike until they are safely docked again at Divvy stations. More than 1,500 annual memberships, priced between $75 and $125, have been sold since registration began at the end of May. Starting with 68 stations in downtown and River North, Divvy is contracted to operate 3000 bikes and 300 stations by the end of August and aims to expand to about 4000 bicycles and 400 stations all over the city by next spring. 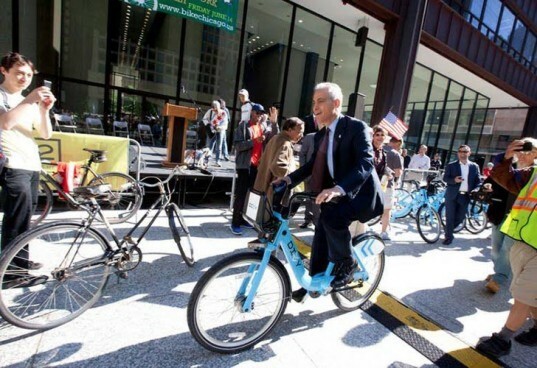 The system is owned by the Chicago Department of Transportation and is operated by Chicago Bike Share, a wholly owned subsidiary of Alta Bicycle Share.